Pack your trunks. Round up your rats, and get ready for a wand-waggling adventure aboard Harry Potter’s own Hogwarts Express, which has steamed onto a resurrected Platform 9 3/4 at the Warner Bros. Studio Tour London. I had a track-side chat with Mark Williams, a.k.a. Mr. Weasley, about movies, memories and magic. For more info on the Warner Bros. Studio Tour London and “The Making of Harry Potter” experience, check out my story here. Amy Laughinghouse, March 5, 2015. 5 Comments on Mr. Weasley Visits the Harry Potter Warner Bros. Studio Tour London. Category: England, Europe, London, Movie & TV Themed Travel, United Kingdom. Tagged: Harry Potter, Hogwarts, London, movie tours, travel, United Kingdom, Warner Bros. Studio Tour London. 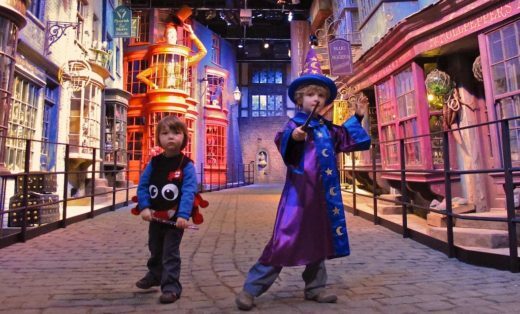 A wee wizard & his brother, a mini-Aragog, strike a pose in Diagon Alley. LEAVESDEN, ENGLAND: I’m whizzing over the Thames, the wind in my face, so close that I can dip my hands in the water. Then suddenly, not of my own volition, I’m soaring heavenwards, only to rocket back down to earth moments later, dodging cars and buses on London’s busy streets. Oh, and did I mention, I’m riding a broom? Boarding a bucking Nimbus 2000 in front of a special effects green screen is just one of the hands (or in this case, bottoms) on attractions at the “Warner Bros. Studio Tour London: The Making of Harry Potter” experience in Leavesden, 20 miles northwest of London. Unlike the The Wizarding World of Harry Potter in Orlando, Florida, the U.K. doesn’t feature theme park rides like roller coasters. Instead, Leavesden offers a true behind-the-scenes look at the Harry Potter movies, which were primarily shot on a soundstage next door. 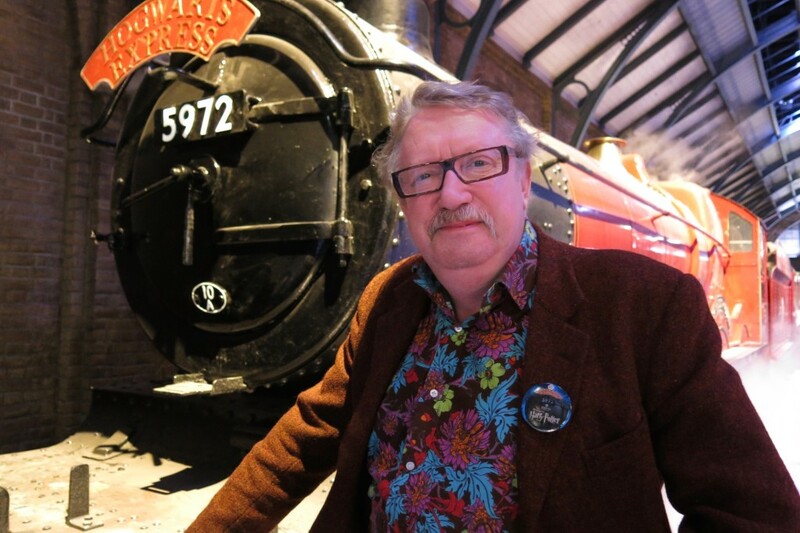 It embraces 170,000 square feet of space bursting with the actual sets, costumes, props and magical machines, including the original Hogwarts Express steam engine, parked alongside a recreated Platform 9 3/4. Amy Laughinghouse, March 5, 2015. 1 Comment on Off To See The Wizard: Harry Potter London Studio Tour. Category: England, Europe, London, Movie & TV Themed Travel, United Kingdom. Tagged: Harry Potter, Harry Potter tour, Hogwarts, London, movie tours, travel, Warner Bros. Studio Tour London.